You are at:Home»Stories»About us»Thank you for the award for our POLcast! We are very happy that in just 1.5 years since we started, we have received three awards for POLcast. It feels really great to see that our work is appreciated and considered valuable by our professional circles. The most recent award, which we had the honour of accepting at a beautiful gala, was the Canadian Ethnic Media Association’s award in its new category of Podcasting. Previously, Margaret P. Bonikowska received the CEMA Award for Journalistic Excellence in the category of PRINT for “Gazeta” at CEMA’s 25th anniversary gala in 2003. The Canadian Ethnic Media Association is comprised of professionals engaged in print, web journalism and writing, reflecting Canada’s diversity. CEMA supports the principles of Canadian citizenship, multiculturalism and the right of free expression without ethnocentric bias. 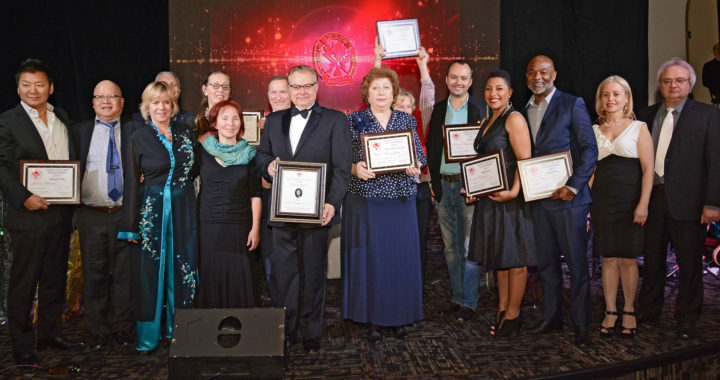 The Canadian Ethnic Media Association’s 39th annual awards gala, held in Toronto on Friday, November 24, was a resounding success. It attracted large audience that included not only the award winners, but also a number of federal and provincial politicians, such as such as Jagmeet Singh, the newly elected Federal NDP Leader, and the Hon. Laura Albanese, MPP, Ontario’s Minister of Citizenship and Immigration, a former journalist herself, and a longtime supporter of CEMA. • PRINT: Arkady Cherkaso, a writer for Saint Petersburg Magazine, for the article titled National Anthem of Canada, examining the English and French lyrics, and how they reflect the bi-national character of Canada. • SPECIAL RECOGNITION: Sophia Tovmassian, publisher and editor of Saint Petersburg Magazine, for efforts in highlighting Canada 150 in “National Anthem of Canada: Two Different Wording Versions, Two Different Geographical Perceptions of the Country”. • DOCUMENTARY: Jinung Chung, producer, Jbyl Video Production, for the documentary “Me and My Harmonica,” the inspiring story of one man’s efforts to bring peace and harmony to the world. • RADIO: Minelle Mahtani, host, Roundhouse Radio 98.3, in Vancouver, for the daily radio show “Sense of Place”, and innovatively showcasing minorities and their productive alliances with indigenous groups. • HONOURABLE MENTION: Nazima Sohni Uppal, producer, 101.7 World FM, for “Ramadan Moments”, an insightful series of radio reports focusing on the personal thoughts of young students at a private faith-based Islamic school. • TELEVISION: Gregory Antimony, producer, Ethnic Channels Group, for “Sounds of Canada,” a unique television series showcasing the music and cultural profiles of Canada’s diverse ethnic and national groups. • PODCAST: Margaret P. Bonikowska & Tomek Kniat, creators and hosts of POLcast, the first English language podcast about Poland and Poles around the world, made universally accessible and delivered directly to the recipient. • INTERNET: Marina Chernova, producer, Radio Megalolis Toronto, for the news series “Canadian Cities Stories”, presented by the first nationwide Russian language online radio station. • INNOVATION: Camille Dundas, editor-in-chief, ByBlacks.com, and Roger Dundas, publisher, ByBlacks.com, an online magazine for and about the Black community in Canada. Thank you, the jury and CEMA for the prestigious award and for recognizing our work and POLcast.